Handball is often described as a mix of a several sports — basketball, soccer, water polo, maybe a bit of lacrosse — with its roots in Europe. You could say something similar about the men on the Canadian national team. Handball is often described as a mix of a several sports — basketball, soccer, water polo, maybe a bit of lacrosse — with its roots in Europe. You could say something similar about the men on the Canadian national team. Five of the 15 competitors on the squad hail from Europe. Niklas Etter (Biel, Switzerland), Norbert Pavlisin (Humenne, Slovakia), Mark Alan Walder (Steffisburg, Switzerland), Casper Bilton (Glostrup, Denmark) and Tim Sartisson (Hamburg, Germany) were all deemed eligible for the team via the heritage of their parents. Canadian captain Dan Devlin believes that mix of international flavours could be the key to the team's success at the Pan Am Games. "Everyone's so knowledgeable," said Devlin, following Canada's 28-25 defeat of Dominican Republic Sunday afternoon. "They take little things from Germany, from Switzerland, some from Canada, some from France, and when we bring it all together it creates a really good performance." All five European-born players have experience playing in pro leagues on the continent. Four Canadian-born players — Olivier Jung (Ancienne Lorette, Que. ), Tyrell Johnston (Edmonton), Alexis Bertrand (Hauterive, Alta.) and Lyndon Suvanto (Onoway, Alta.) — also have pro experience in European leagues. Despite its players' far-flung origins and varied cultures (Walder and Pavlisin speak multiple languages), team chemistry is one of Canada's strengths. "Sometimes [the language barrier] is a little bit challenging, but everybody speaks some English so that's usually not a problem," said Devlin, a 31-year-old Edmonton native. "Every guy on the team brings his own little uniqueness and quirkiness to the team and it just really meshes quite well for everyone." 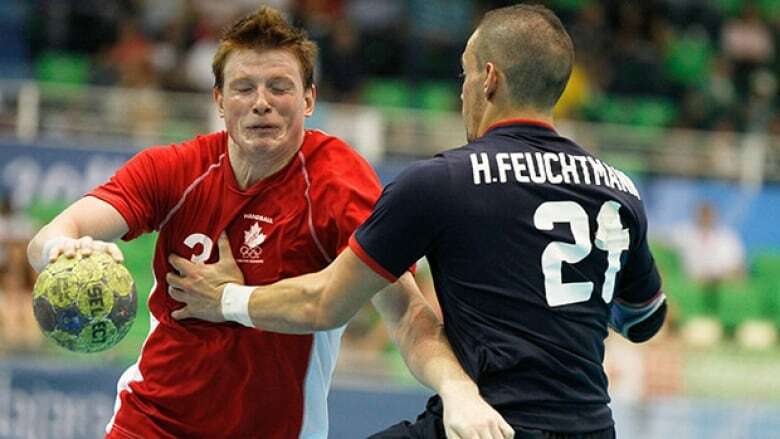 The team's experience playing outside Canada is key considering the popularity of handball, or lack thereof, in this country. It's a unique feeling to play in front of the home crowd, something players without Euro experience aren't used to, but the crowd at Exhibition Hall B has been electric. "It's the first time we get to play at home in a big competition like this and it's nice to finally have the crowd on your side," said Devlin. "In years past, without that crowd, we never know what's going to happen." "Every time we went to South America they'd boo us because we're like the bad team from North America, but here, I can't describe the feeling, I feel overwhelmed," said the 35-year-old. After finishing fifth at the 2011 Pan Am Games in Guadalajara, the men are hoping to capitalize on their rare chance to play at home as well as their multitude of new fans. "Everyone that I've met so far has said 'We haven't seen handball live before and we weren't really fans but we're fans after watching that game,'" said Devlin. "We want to bring home a medal for Canada and for our fans, new and old.